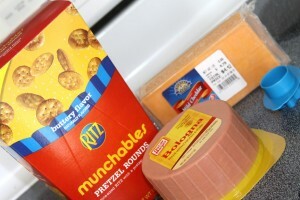 Here is a great way to make your own “Lunchables” style sandwich crackers for your kiddos. They are quick and easy and a great option if you are traveling with your kids. Cut your favorite meats and cheeses into bite sized shapes and pair them with some bite sized pretzel crackers for a tasty snack or filling lunch on the go. Since the first time my son had a Lunchable in his hands it was pure love. 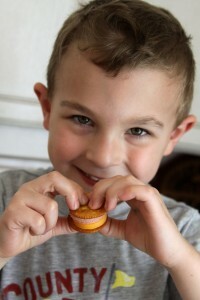 Not sure what the obsession is, but he loves them with all his little 5 year old heart. It must just be the fun of making the little sammies just the way he wants them. If ever I ask him what he would like for lunch, I get the same answer, especially if we are traveling. Last time I asked him what he wanted to take to school for snack to share with his friends I got the same answer. Sigh… 20 lunchables? I think not! We love to have cracker sandwiches at home for snack, and sometimes even as a lunch. So with lunchables in mind and an idea I have been using for a couple years I put together our own version of the lunchable. Remember last summer when I showed you the bite sized sammies that I use when traveling with the kids. 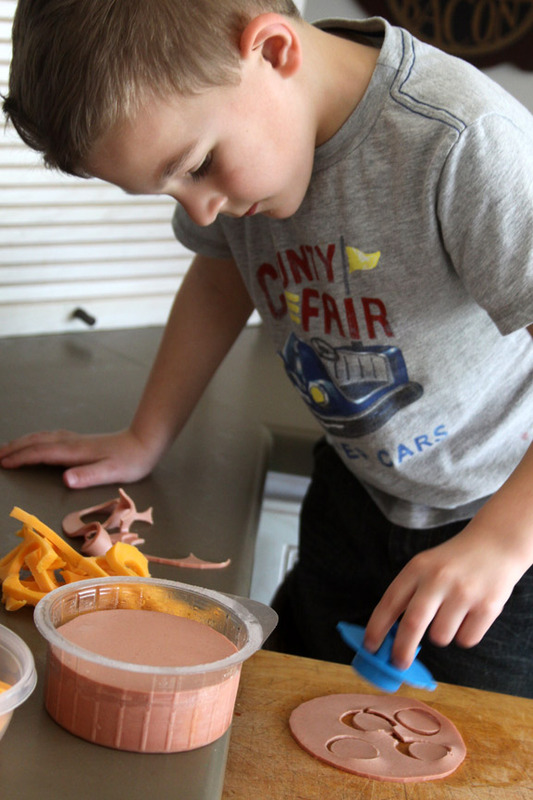 I use play dough tools from the kid’s massive selection to cut sandwiches into the perfect bite sized shapes. Using the same idea, we began making circular bite sized servings of meat and cheese using a little play dough tool. We have been making these for a long time now, and my son loves to get in on the preparation, especially when they are going to be a snack to take to school. I let him choose the type of meat that he wants, and the cheese as well. Bologna would not be my first choice, but the kids like it! You can use any type of meat and cheese that you like to make these. Make sure you get a thick cut of meat though, so that it can be cut into a shape easily. Cut as many little circles out of each piece of meat and cheese as possible. I buy a brick of cheese, and then cut it into manageable slices so the little guy can cut the circles out on his own. Worried about waste? With the leftover pieces of cheese I usually cut them up and throw them into a pasta salad or something, I never throw it away. 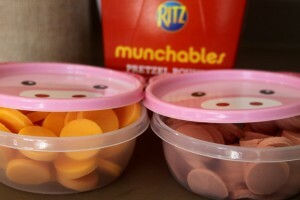 I put the cut-out meat and cheese bites into cute little containers that I found at the dollar store. 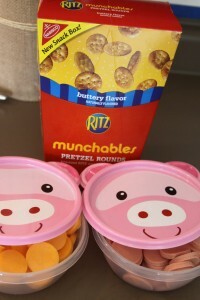 I bought the package of 2 for $1.00 and they work great for our “lunchables”. The little containers are stack able so I can throw them in the cooler and go. We love the Ritz Munchables pretzel rounds for these sandwiches. They are the perfect size for the kids to stack and make little cracker sammies. If you are traveleing and need a quick and mess free snack in the car take a few minutes and throw these together. I hope your kids love them as much as mine do! A full kid is a happy kid, especially if they are making and eating bite sized cracker sandwiches!